The Bianchi Remedy Model 57 Belt Loop Holster is an open-top design for semiautomatics and small frame revolvers, which fills a niche in the Bianchi line previously not offered. The Model 57 Remedy by Bianchi features a fully molded holster front for improved comfort, and the open top design provides quick and convenient access. 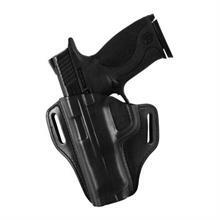 It's designed for hip carry and features deep contour molding, making visible the distinct shape of the handgun it holds.